A teen idol of the 1950s who virtually invented the singer/songwriter/heartthrob combination that still tops pop music today, Paul Anka rocketed to fame with a slew of hits-from "Diana" to "Put Your Head on my Shoulder"-that earned him a place touring with the major stars of his era, including Chuck Berry, Jerry Lee Lewis, and Buddy Holly. He wrote Holly's last hit, and just missed joining the rocker on his final, fatal plane flight. Anka also stepped in front of the camera in the teen beach-party movie era, scoring the movies and romancing their starlets, including Annette Funicello. When the British invasion made his fans swoon for a new style of music-and musician--Anka made sure he wasn't conquered. A rapier-canny businessman and image-builder who took his career into his own hands-just as he had from the very beginning, swiping his mother's car at fourteen to drive himself, underage, to his first gigs in Quebec-Anka toured the world until he could return home in triumph. A charter member of the Rat Pack, he wrote the theme music for The Tonight Show as well as his friend Frank Sinatra's anthem "My Way". By the 1970s, a multi-decade string of pop chart-toppers, including "Puppy Love" and "(You're) Having My Baby", cemented his status as an icon. 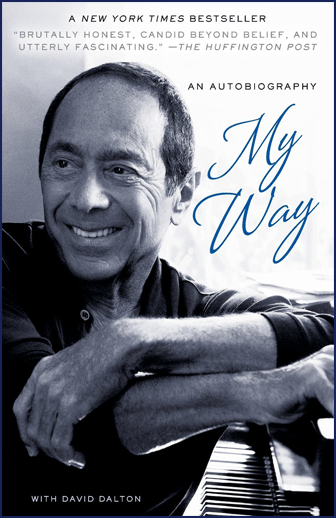 My Way is bursting with rich, rollicking stories of the business and the people in Anka's life: Elizabeth Taylor, Dodi Fayed, Tom Jones, Michael Jackson, Adnan Khashoggi, Little Richard, Brooke Shields, Johnny Roselli, Sammy Davis, Jr., Brigitte Bardot, Barnum & Bailey Circus acrobats, and many more. Anka is forthcoming, funny and smart as a whip about the business he's been in for almost six decades. My Way moves from New York to Vegas, from the casino stage to backstages all over the world. It's the most entertaining autobiography of the year.